Born the son of a Church of England bishop in 1905. Attended Oxford University where he befriended a fellow student named Claud Cockburn but left the school without graduating. Obtained a job with the British American Tobacco Company and was sent to Shanghai. While in Shanghai was believed to have come in contact with Richard Sorge, a top Soviet spy as well as Communist agents Agnes Smedley and Ruth Kuczynski (Kuczynski developed several Soviet spy rings in Europe and the Far East). Developed a case of tuberculosis in 1934 and traveled to Switzerland for medical treatment, passing through Moscow first by way of the Trans-Siberian railroad. After being cured, returned to England and sought employment with the SIS in 1938. Although he was rejected due to his poor health, he joined MI5 in 1939. Within MI5, worked with the Branch that focused on the Communist Party and the Soviet Union. Would later help to set up the Australian Security and Intelligence Organization and then served as the head of MI5’s C division that handled internal security issues. Was promoted to the position of Deputy Director of MI5 in 1953 and then became the Director in 1956. Was sent to Canada in 1945 for his first important mission. Was to debrief Igor Gouzenko, a former cipher clerk within the Russian Embassy in Ottawa, Canada who had defected to the West (MI6 officer Kim Philby should have handled the matter but was busy trying hush up another Soviet defector). Was told by Gouzenko of a major Soviet penetration of MI5 and specifically about the existence of a high level mole within (codenamed “Elli”). Hollis failed to report Gouzenko’s allegations. In 1961, KGB defector Anatoli Golitsyn described an elaborate spy ring within Britain, naming Guy Burgess and Donald MacLean as members of the “Ring of Five.” As MI5 began to close in on Philby, who it was thought, was another member of the ring, he was tipped off about his impending arrest and fled to Moscow in 1963. 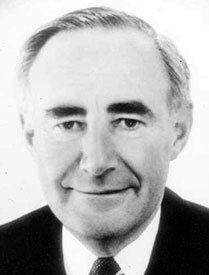 Hollis was one of only five senior-level MI5 officer who knew that Philby was to be arrested and it is believed that he tipped off his friend. In 1963, failed to provide British Prime Minister Harold MacMillan with information concerning Russian spy Yevgeny Ivanov, who was involved in the Profumo scandal that rocked England and eventually forced MacMillan to resign his position. In 1964, approved of the deal in which Anthony Blunt, the fourth member of the Ring of Five, received immunity from prosecution. Was knighted by Queen Elizabeth and resigned in 1965. Was the subject of intense speculation based on numerous close, personal friendships and contacts with known and exposed spies as well as his less than stellar tenure and the Director-General. Hollis was referred to quietly as Mr. Inertia because of his lethargy in taking action. Was brought into MI5 offices and questioned at length by intelligence officer Peter Wright and Sir Martin Jones, the man who replaced him as Director-General. Hollis denied being involved in any espionage activities against Britain and the matter was closed. Still, several books have boldly stated the likelihood that Hollis was indeed the Fifth Man. After his resignation, was divorced by his wife of more than 30 years and married his long-time secretary. Died in 1973.